This is just a really quick, short, unplanned post. I recently went to the Furusato Matsuri that was held in Tokyo Dome. The Furusato Matsuri showcases many of the famous festivals across Japan. It has been held annually since 2009 and as well as performances from the far flung festivals, you can also sample local delicacies and regional sake and craft beer. I hadn't planned on doing a blog post about this, and this short update isn't one about the whole event. I would have to go on a much quieter day than the final day to be able to do the festival justice. I just wanted to talk about a couple of the things I experienced during the day. One of the stalls that I went to on the day was one put on by a craft beer brewer from Fujizakura heights brewery located on the shores of Lake Kawaguchi (you can find a write-up of the beautiful Lake Kawaguchi here) and in the shadow of the majestic Mount Fuji. They make German style beers and I ordered one called "Rauch". I had no idea about what the word Rauch meant in English, but man, was I about to find out. Lifting the beer up to my mouth I took a sniff to smell the aroma and got a complete shock, kind of like this. The smell was of bacon! I took a careful swig and allowing the beer to linger to get the full taste, there it was again. It was a really smokey, meaty, bacon flavour. I was shocked! I had never had a beer like this! This beer has won awards at international beer shows, and I understood why! I went back 2 more times for more! Trust me, if you are ever near Lake Kawaguchi, look them up. They have a bar / restaurant there. It will be well worth it! 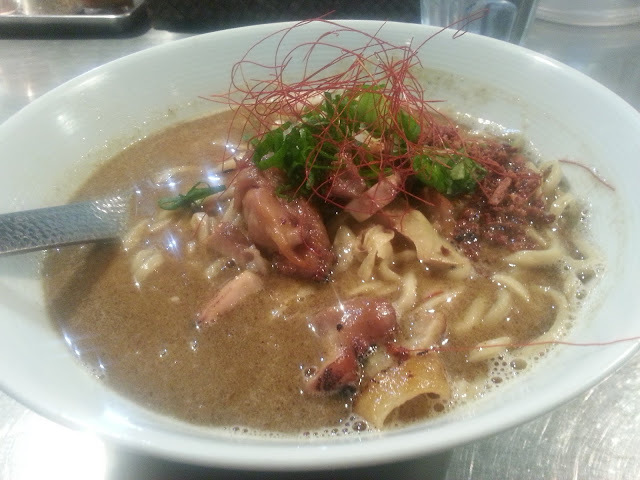 Anyway, after the Furusato festival we went to a place that one of the other guys new about at nearby Ochanomizu. It is called 1899 Ochanomizu and it is a green tea restaurant. We didn't go there for food though. If you check out their menu you will see that they have a green tea beer! 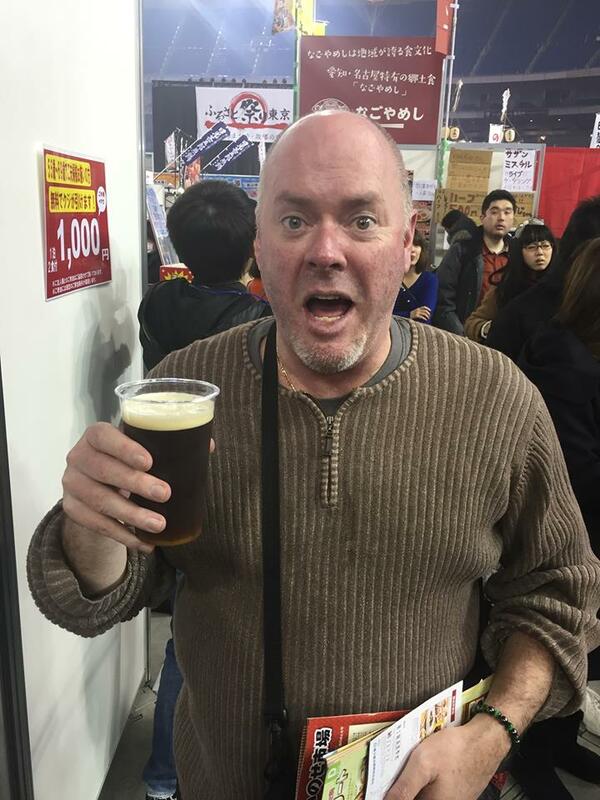 Like the bacon beer, it was a beer unlike any I had tasted before. 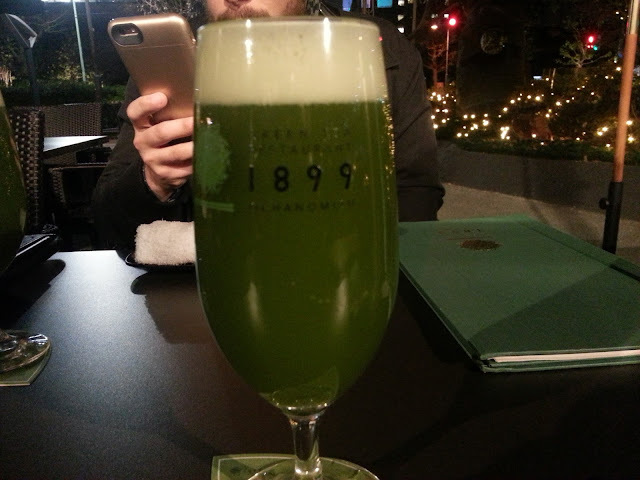 The flavour was much more green tea than beer. It was interesting, but I would have to say that I preferred the first beer to this one, but if green tea is your thing, I would definitely recommend checking out this restaurant. I left everyone at this point and decided to head home as I had to work the next day. On my way home, however, I got off the train at Shindaita station (on the Inokashira line). Coming out of the station I crossed the road straight away and headed right. Less than 100m from the station is a ramen place called Bassanova (sorry, I couldn't find a website for them). Now Bassanova is famous for a couple of unique bowls of ramen, both Thai influenced. One is a Tom yum ramen and the other is a Green curry ramen. Now not being a seafood lover, but definitely a thai curry lover, I opted for the second. Pretty soon it arrived. Now don't come expecting a coconut curry soup. 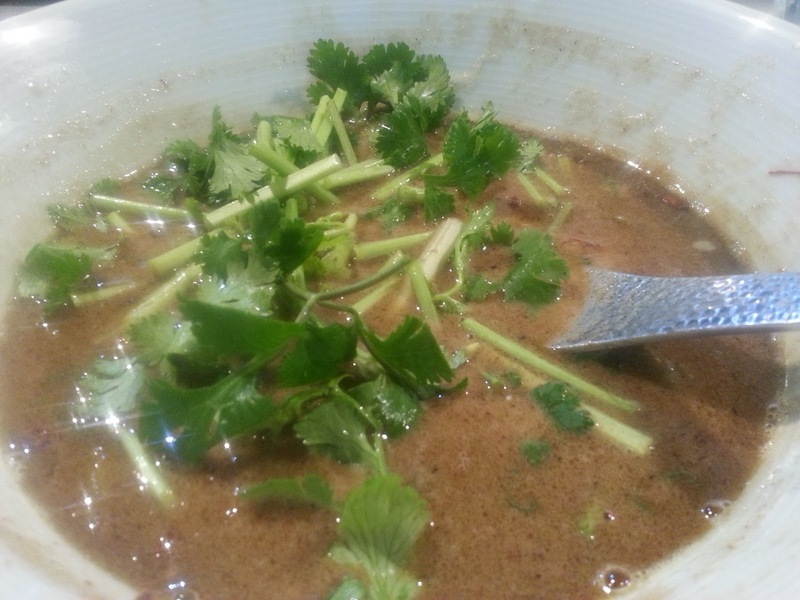 No, this one has a base of beautiful salty, rich tonkotsu (pork) soup with a green curry paste mixed in. It was a blend that worked so well together and the boys here at Bassanova have done a great job perfecting the blend. Pretty soon the noodles and the chicken on top (a delicious smokey chicken.......yeah, I know, chicken and green seemed to be the trends of the day!) were gone and I noticed that you could order a side serve of coriander (or cilantro depending on where you are from), so that's exactly what I did. That provided a fresh contrast to the saltiness of the soup that gave an added element to the bowl of ramen that contributed even more to it's uniqueness. If you are after something different in your bowl, Bassanova if worth a look. Thanks for reading this short post. As I said, I wasn't planning on this one, but the day provided some things that were completely new and different that I just had to share them. Please leave a comment below and subscribe on the toolbar to the right of the screen and I'll see you next time. Hello Jason,it seems you have indulged on some new tastes...I can imagine that will always be the case in Japan and in such a large city as Tokyo.I hope you will enjoy your visit to Himeji in Grote Street.I have had ramen there 3 times..the same dish each time and it was a good dish.Perhaps I will try something different next time as there are plenty of interesting dishes listed on the menu.Let's hope you find the food to your liking and the ambiance of the place.I have only eaten at the bar,as I was there by myself.I found the coffee there was really good. I trust all is going well for you in Tokyo,unlike the Dons, who will be lucky to win a match this year and are facing legal action by the suspended players. I know that you are going to be really busy whilst back in Aust. but if you have some free time next week,then please me know...I may be able to come into the city to say hello over a meal or coffee.My mobile number is :0414373197.You can text me on the day if you like.